Dionne grew up in Trinidad, moving to Canada at 17 to attend the University of Toronto. 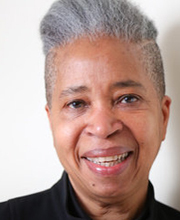 She has taught at numerous universities and writing programs across Canada, founded Our Lives, Canada’s first black women’s newspaper, and has been involved in many social, labour, and community organizations, including the Black Education Project and Toronto’s Immigrant Women’s Centre. Dionne is a poet, fiction writer, anthologist, editor, and a documentary filmmaker. Her work has won the Governor General’s Award, Trillium Award, the Griffin Prize, and the Pat Lowther Award for poetry. She was Toronto’s Poet Laureate in 2009, is a recipient of the Harbourfront Festival Prize, and has been named to the Order of Canada. In her latest collection of poetry, The Blue Clerk: Ars Poetica in 59 Versos, Dionne’ stages a series of conversation between a poet and the titular clerk, who is the keeper of the poet’s left-hand pages–the unwritten, the unexpressed, and the restrained. Their dialogues invoke a host of writers, philosophers, and artists, from John Coltrane to Jorge Luis Borges, and explore memory, language, culture, and time.